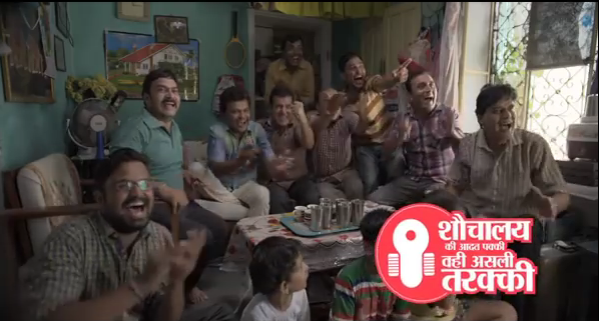 Most of the memorable advertisements recently have resorted to the funny route; considering the rising TRPs of Television shows like “The Kapil Sharma Show”, “Bhabhiji Ghar Par Hein” and advertisements like “Fogg Chal Raha Hai”, it comes as no surprise that humor is the in-thing as far as advertising is concerned. And considering the last few attempts, nobody seems to have got it right like the Ministry of Urban Development. After the Goddess Lakshmi advert featuring Kangna and Bollywood’s other bests, to remind the citizens of India about the importance of using lavatory in the latest phase of the ongoing Swachh Bharat mission, the ministry has released a string of mockery-based ads. These advertisements use humor and embarrassment as the main element to deliver their message. These three ads, conceptualized by McCann Worldgroup, tap into three dimensions: build a toilet if you haven’t, use public toilets and use the toilet you’ve built instead of defecating in the open. Like in one of the ads, Vicky, the protagonist is seen going around his neighbor’s house handing sweets for landing a job in a bank, all the while receiving complements and exchanging fond glances with Shalu, a young girl. As he is about to hand the girl sweets, a little kid takes dig at him saying he should have got a job in the railways instead, for he uses the tracks to defecate. While Vicky stands embarrassed, the film ends with the message, ‘Tarakki ki nishaani, sirf naukri nahi hai jaani; Shauchalya ki aadat pakki, wahi asli tarakki” (The use of toilets, is real progress). The advertisements circle around the progress people are making in their day to day life but how they still fail to make progress in terms of using proper institutions while answering nature’s call. What We Like? : We particularly enjoyed the adverts due to their wholesomeness in terms of the big idea (using slices of life to drive the point home), the perfect rural settings, the small, subtle jokes distributed across each advert in the form of rural characters and their attributes, the earthy music, and ofcourse, the final message which drives the point home, very simplistically touching upon a matter as sensitive as that without making it sound despicable.